I’m not here to tell you that pineapple will magically melt fat, because it won’t. But what it will do is fuel your body with the necessary nutrients that can help you achieve your weight loss goal. 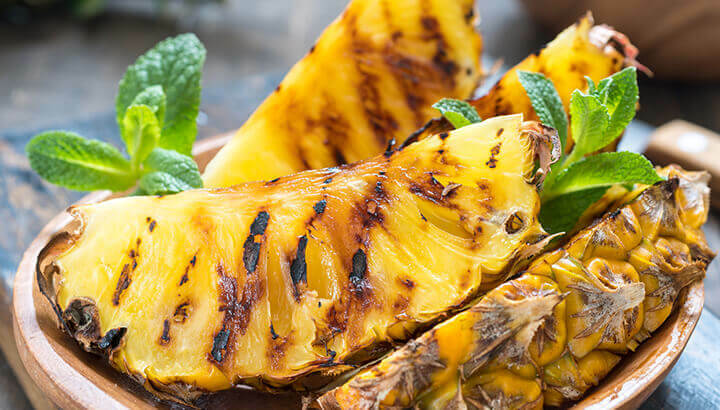 Furthermore, pineapple has a unique inflammation-fighting enzyme. And, inflammation and weight gain are closely connected. How does pineapple burn fat? Pineapple is juicy, sweet and delicious. It’s often misrepresented as a fruit that can burn fat, most likely because of its main enzyme, bromelain. Bromelain can help reduce inflammation in the body — but more on that later. However, even if pineapple can’t physically burn fat, it does have nutrients that can certainly help you reduce fat. So, don’t give up on pineapple just yet. Many benefits of pineapple are due to its high concentration of vitamin C. Vitamin C is a water-soluble vitamin, which means your body doesn’t store it. Therefore, you need to get enough from vitamin C-rich foods like pineapples. Vitamin C plays an important role in maintaining the health of the body’s connective tissue as well as acting as an antioxidant. The RDA for vitamin C is 90 milligrams a day for men and 75 milligrams a day for women. The daily value (DV) is 60 milligrams. DVs are based on a 2,000-calorie diet for healthy adults. Pineapple has a whopping 79 milligrams of vitamin C per cup. That 131 percent of the daily value. Too little vitamin C in the blood stream leads to increased body fat and waist measurements. A 2006 study from Arizona State University reported that the amount of vitamin C in the blood stream is directly related to fat oxidation (the body’s ability to use fat as fuel) during both exercise and at rest. At the beginning of the study, participants with the lowest concentrations of vitamin C in their blood had the highest body fat mass. They could not oxidize fat as well as those participants who were less obese. But, as the study progressed, those same participants who consumed a steady amount of vitamin C increased blood vitamin C concentrations by 30 percent. The participants who only consumed 67 percent of the recommended daily allowance from food saw a decline in vitamin C blood concentration. So, their ability to oxidize fat decreased. Since pineapple is such an excellent source of vitamin C, just one cup a day could aid your body’s ability to turn your fat into fuel. Is pineapple good to eat on a diet? Low in calories, nutrient-rich and a good source of fiber makes this tropical treat a great addition to any diet. Pineapple consists of 86 percent water and 13 percent carbs, and no fat or protein. At only 83 calories per cup, pineapple is ideal as a low-calorie snack or dessert. It’s also an excellent source of manganese, a mineral needed to metabolize carbohydrates and fat, which is important for energy production. Low manganese levels are linked with osteoporosis, diabetes, arthritis, PMS and epilepsy, according to the University of Maryland. But manganese deficiency is rare in the United States. One cup of pineapple supplies you with about 2 milligrams of manganese. Adult males need about 2.3 milligrams daily and adult females need 1.8 milligrams. Pineapple is low in calories and nutrient rich. The glycemic index (GI) is a measurement for carbohydrate-containing foods and how they affect blood glucose levels. Low GI diets are linked with decreased risk of certain conditions like cardiovascular disease, type 2 diabetes, metabolic syndrome and stroke. Carbohydrates with a low GI value of 55 or less are more slowly digested, absorbed and metabolized. In turn, they cause a lower and slower rise in blood glucose and, therefore, insulin levels. The glycemic index value of pineapples ranges from 45 to 66. That places them at a low to medium range, according to the University of Sydney, which means that pineapples should not have any major effects on blood sugar levels. One cup of pineapple contains two grams of fiber. Almost all — 99 percent of it — is insoluble. Insoluble fiber is the type of fiber that most people think of as “roughage.” It’s the hardy fiber found in whole grains, nuts, veggies and fruits that don’t dissolve in water. In fact, insoluble fiber isn’t broken down by the gut and absorbed into the bloodstream. Instead, it adds bulk to waste in the digestive system. That helps keep you regular and prevents constipation. Your total dietary fiber intake should be around 25 to 30 grams a day from food — not supplements. Fiber is so important for dieting because it requires more chewing and takes longer to digest. This helps your body recognize that it is full and prevents you from continuing to eat. Diets rich in fiber are linked to decreased risk of cardiovascular disease. Insoluble fibers have also been linked to reduced risk of type 2 diabetes, according to a German study. And another study by the American Dietetic Association found the insoluble fiber leads to lower body weight. Can pineapple juice help you lose weight? Pineapple juice contains bromelian to fight inflammation. 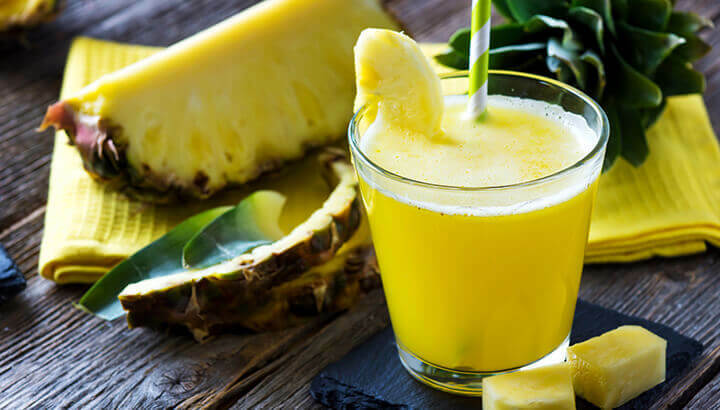 Pineapple juice is packed with vitamins and minerals, but it can’t magically help you lose weight. That said, it offers a significant amount of vitamin C, which aids in weight loss. It may also help reduce your risk of constipation and improve overall digestion. But the real benefit to pineapple juice is bromelain. Bromelain is a mixture of enzymes found in pineapples that digest protein. Bromelain can be used to treat several conditions. But it is particularly effective in reducing inflammation. Although inflammation is part of the body’s natural defense system, too much wreaks havoc on your body. Incidentally, eating the fiber-rich core of a juicy, ripe pineapple is the best way to consume natural sources of bromelain. The riper the fruit is, the softer the core will be. A great way to get your bromelain fix is by juicing the core of the pineapple or simply throwing it into a smoothie. Drinking fresh pineapple juice has been shown to be a powerful remedy against inflammatory diseases. A Duke University Medical study found that supplementing your diet with fresh pineapple juice actually decreases inflammation. And inflammation is the link between obesity and metabolic syndrome, suggests a study in the Journal of Nutrition and Metabolism. Pineapple is a good source of thiamin, which is a B vitamin that’s essential to energy production. And, anyone who’s ever been on a diet understands the importance energy plays. Let’s face it, when your energy is low, that’s when you’re most likely to grab a box of high-sugar, high-fat cookies. Pineapple not only fills you up with few calories, but it will also provide you with a healthy source of fuel — that combats inflammation! Pineapple may not a miracle fat-burning fruit that some claim, but there are definite reasons why you should include it in your diet. Previous articleWhat Is Activated Charcoal Used For? 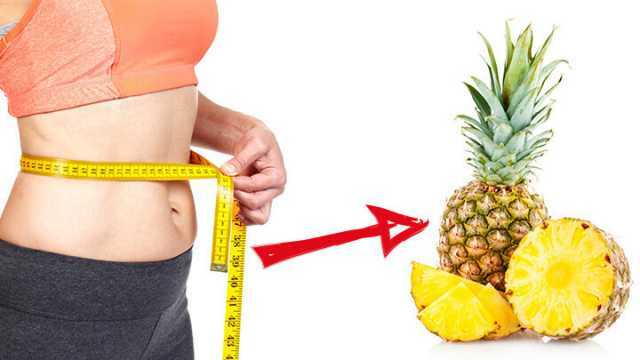 Hey Buddy!, I found this information for you: "Pineapple Benefits For Weight Loss". Here is the website link: https://www.thealternativedaily.com/pineapple-benefits-for-weight-loss/. Thank you.